Nothing is more important for the Labour Party than winning the next general election. But to do this, Labour needs to do two things, not only oppose Tory ideologically-driven cuts, but also to set out an attractive alternative to improve peoples’ standard of living. It is for this reason that we must be both a firmly anti-austerity and pro-investment party, with a leader who has a clear record of standing up not standing by, and can win the public’s trust. Now more than ever, Labour needs to fight to protect our public services and stand up for the majority of people in the face of the Conservatives’ ideologically driven offensive. Austerity continues to decimate our vulnerable communities, with the worst effects of cuts to public services and reforms to welfare still to come for many, especially with the choppy economic waters ahead following the EU referendum result. To give just one example of the lack of security in austerity Britain, a recent report from Shelter showed that one in three families in England could not pay their rent or mortgage for more than a month if they lost their job. But it is not just those on low incomes being hit. Across the country each household lost £1,127 on average under the last government just through tax and benefit changes. Real wages fell for seven years — and the decline only technically stopped because inflation dropped even lower than wages. The Tories’ age of austerity has ushered in a boom in low-paid, insecure jobs with few or zero guaranteed hours. Today six million working people are paid less than the living wage and poverty among those in work is at a record high. At the same time the wealth of the richest 1,000 people in Britain has doubled since the financial crash. Measures such as cutting the top rate of income tax have given the lie to the notion that the government is somehow cash-strapped. Indeed, we live in the most unequal country in the EU. The growth in inequality here is of such a scale that it is helping to drive increasing inequality across Europe as a whole. It is utterly staggering. And yet it’s a fact which probably many of my constituents, for example, are somehow not surprised at. Here in our capital city gleaming glass towers overlook some of the most deprived areas of the country. Social and affordable homes are sacrificed for flats and houses which only the wealthiest can afford. But this all changed with Jeremy Corbyn’s successful leadership campaign last summer. After our failure in the last election on an ‘austerity lite’ platform, under Jeremy Corbyn’s leadership since last September we have been transformed into a clear anti-austerity, pro-investment, party. For the first time, our leadership team, including Shadow Chancellor John McDonnell, have made it absolutely clear that austerity is a political, ideological project, not an economic necessity. This has started to shift the political framework of debate in Britain, as has been shown by the nature of Owen Smith’s leadership campaign, where he has admitted it was wrong for the temporary party leadership – including all the other leadership candidates than Jeremy – at the time to abstain on the Tories’ destructive Welfare Biil. In the time Jeremy has been party leader, Labour has forced government U-turns and defeats on over 20 issues, including the proposed cuts to tax credits and personal independence payments. And our stance has seen us make step forwards electorally – Labour has won all the recent mayoral contests. In May, our national share of the vote – the most important indicator – was up. At the 2015 general election, we were nearly seven points behind. In May, we were a point ahead. Under Jeremy’s leadership, we have put back on the political agenda that Britain needs a proper industrial strategy which invests in the industries and technologies of the future. Now to move forward, Labour needs a clear plan to stand up for the interests of the majority and defend their living standards from the cuts. It should clearly oppose the assault on civil liberties and human rights that this government wants to inflict. And Labour needs to embrace Britain’s rich diversity and extol its economic, social and cultural benefits. Jeremy Corbyn clearly understands that our relationship to the economy, the environment and our political system needs to be radically transformed. That is why his ten pledges to rebuild and transform Britain provide the policy platform and vision for us to do this, defend our communities as an effective opposition, build the momentum for a Labour win in the next General Election, and then transform Britain into a fair, more equal and democratic society where no-one and nowhere is left behind. But Corbyn has as much chance of achieving that as I have of bettering Simone Biles in a gymnastic floor routine. Jeremy as PM? It’s a non starter. The left must do what it thinks best and that includes destroying the Labour Party and not winning the next general election. Moderate Labour Party supporters should join with the LibDems and leave the Labour Party to wither on the vine. Leave the young hipsters in their reality distortion field. They can imagine living in Soviet Russia if they want. Although no Russians will want to join them there. English wards won’t be voting in a left-wing government ever again and Scottish people won’t be voting for an English left-wing party ever again. All that means is that a left-wing Labour Party is toast. England is a centre and right country. Leftism is for the fringes of politics and the fringes of the UK. The main reason that Labour lost the last election was that swing voters did not perceive Ed Miliband to be a prime minister in waiting. When the individual Labour policies were polled, they did very well. In fact, raising the minimum wage closer to a living wage was stolen by the Tories, and OFGEM is now considering the sort of price controls that were ridiculed by the right wing press at the time. Ed’s nickname at the Treasury was ‘Brains’ – he was acknowledged to be very bright and knowledgeable. He was a bit awkward on the public stage, and that’s what sank him: the right wing press saw a slight opening, and they wrenched it open. Now imagine what is going to happen to Corbyn, and to an even worse extent McDonnell, who has an even worse track record on IRA sympathising (and yes, that’s exactly what it was). Whilst CND has a lot of support in the Labour party, the country on the whole backs the UK retaining nuclear weapons. The press and the political advertising from the other side will present Corbyn and McDonnell as terrorist sympathising appeasniks, bent on the subjugation of Britain under the Red flag. If Corbyn thinks the heat on him is bad now, just wait for a general election campaign. The Tories will attack him and his inner circle’s personal credibility, because they know that the public on the whole are not raging right wingers bent on the destruction of the welfare state, but that they won’t vote for a weak leader. Corbyn is a weak leader, who throughout a parliamentary career longer than my lifetime (32 years) never demonstrated any other ability than to be a spanner in the works. He will be crushed. No amount of Momentum rallies or Facebook memes will change that. Totally delusional. There isn’t a chance of Corbyn leading labour to a general election victory. If labour persist in having him as leader then the only outcome will be a huge Conservative majority in 2020. Utterly disingenuous & if she doesn’t already know that, she should ! There can be no comparison with the 2015 General Election seeing as the entire country didn’t get the opportunity to vote in May 2016 !! Diane Abbot is spinning so hard, she’s in danger of falling flat on her face. Sadly for us Labour party members & supporters, it’s the actions of her & her mates Jeremy & John, that will ensure the party falls with her. Michael Hynes’ comment nails it. It’s amusing how members of the public like Mr Hynes understand the reality precisely whilst a Labour Party bigwig like Diane Abbott is so delusional. Diane Abott hasn’t given credit to the role of Members of the House of Lords in getting policy changes in particular working tax credits. Her claim of more members now than ever before is wrong in. 1996 Labour signed up its one millionth member, she was from Galashiels, and I introduced her to the then Leader Tony Blair and interviewed them both for the front cover of Labour Party News. 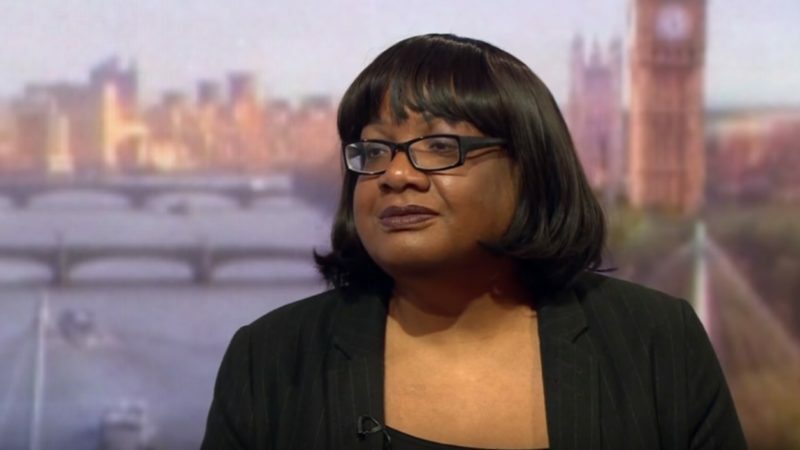 It seems to me that Dianne Abbott has produced a factual account of the election results and it sticks in the throat of those whose main aim is to get rid of Corby no matter what. All the tricks have been attempted. Working with the Tories and the hostile mass media (unfortunately including Kuensberg’s hostile BBC), heralded and stewarded in the background by Alastair Campbell and Peter Mandelson, the rebel Labour MPs have taken themselves and the Labour Party to the brink of ridicule and Splitting from the Party. What else can they do? Unless they re-join the PLP and the Shadow Cabinet. The one thing left in their armoury, which they believe is the “new” trump card, is the unelectability of Jeremy Corbyn argument. Again, all and sundry who do not support Jeremy Corbyn are prepared to defeat him prior to the next General Election because they would prefer a Tory Government before a Corbyn-led Labour Government. Why did Labour MPs who did not really support Corbyn sign his election papers so he could stand for the leadership? Because they believed he had no chance of winning. Why did the press and mass media ridicule Bernie Sanders at the early stage of his primaries campaign? Because they believed he had no chance of winning. Why have Labour ignored the threat from the Scottish Nationalists and UKIP? Because they believed they had no chance of winning. I do not need to go on. The accumulation of wealth in the past was a necessary part of getting the resources to invest in industry. The accumulation of wealth today is a way of empoverishing even more the working people of this country and taking wealth out of industry to invest it in speculation and money lending back to the poor. Of course there will be a rise in left wing support and the strengthening of left wing groups; even more so if Labour does not respond to the needs of working people. The EU has been a mechanism for the enrichment of those economies at the centre of Europe. Germany in particular has no need of regional investment but Spain and Portugal do. German industry exports more than anyone and imports least and Germany spends least on armaments and world intervention. In Britain the rich centre is London and the South East and there has been a weak regional policy under both Labour and the Tories. Supporting industry and the regions is where the EU and the British Governments have failed and the working class know that. Turning around the years of latent destruction and mallaise will need a mammoth task and a truly dedicated leader and government. Who else by Jeremy Corbyn will be dedicated enough to overcome the hurdles and get the task on the road. Owen Smith’s declarations of intent matter nothing because they are hollow declarations of a puppet whose strings are being pulled ultimately by Campbell and Mandelson. As soon as he has done his work (if successful in beating Corbyn) they will turn on him and “smash him back on his heels”. If Owen is true to his colours he will accept the Corbyn victory and work with JC to turn this thing around without the crass remarks or tail-ending walk-outs. The measure of Corbyn will be his first General Election. Not the defeatist accusations of an unholy alliance who are actually extremely afraid of his potential victory. The Tories, the wealthy, the better off have been doing well under all the governments over the last 40-50 years. The rich have got richer and the poor have got poorer. The Tory Government is full of millionaires, Eton schoolboys, and Oxford and Cambridge graduates. The PLP also has its fair share of Oxford and Cambridge graduates. That’s not to say that an Oxford or Cambridge graduate could not be good for the Labour movement. But they need to have learned how our enemies work in order to use that knowledge to protect and improve the standard of living of the Labour movement. Unfortunately they cannot see past the economics of austerity because that’s what the “economists” peddle in their publications, papers and throretical journals. Trade Union leaders should take note that some eggs will have to be cracked to make the omelette. This includes Trident. There is no way we should even contemplate its renewal. Alternatively we should make a bold statement by not renewing and then turn our attention to Bernie Sander’s platform to get the issue firmly debated within the Democratic Party. The Physical waste of resources would be apparent in a struggling economy in Russia as Putin and his successors meet with the demands of the Russian working class. The UK has been without an aircraft carrier and will be for some years ahead. The only 6 frigates in the British navy are all out of action at the same time. The Government cannot carry out the kind of warfare currently required. Where, therefore, is the need? I don’t think it is with Trident. A Labour Government under Corbyn would be a beacon for Europe where the right wing are gaining ground because European Socialist Governments are not responding to the needs of their working people. He3nce the growth of alternative groups like Syriza in Greece and Podemos in Spain. These groups have grown out of the Labour movements in those countries because they had been pushed out of the labour movement. They are fighting for a change in the economic policies of their countries and for a new deal from the EU. There is no need to consider them hostile or to proscribe them. We need to use all the strength of working people to achieve our aims internationally. This is Corbyn’s moment, this is my moment, in history. I have been in the Labour Party since 1969, have fought many a battle from defeating the SNP in the Gorbals in 1969 to campaigning in Tooting in 2016. I call on all Labour Party members to do the same. Once the decision is made, be positive, support the leadership, fight the elections and we shall win. Completely dishonest description of Labour’s position by Abbott – Labour’s position in opinion polls is consistently appalling, Corbyn’s personal ratings are dire, and the party had the worst results in May’s local election of an Labour opposition in living memory. It’s time for new leadership..
Jeremy corbyn has got no chance of being elected. The majority of labour mps will break away when corbyn and his 3 pounders win leadership, or a lot will loose their seats anyway. Why is the LEFT foot forward comments section stuffed full of Right wing comments? I find it laughable that people against Corbyn say he is going down in the polls. No the PLP have brought the polls down. I believe there is a real enthusiasm for change. Blaming the poor and vulnerable for the Politicians failure has gone on long enough. It needs someone to take care of the NHS, build more social housing and invest in the country’s infrastructure. This is possible and Corbyn has the plans to do it. The Labour Party needs to get behind him and make a real difference to the people they purport to represent. The Labour Party could really achieve something amazing if they would just stop the in fighting. Jeremy Corbyn is the o n l y leader in a socialist party in europe – who has a clear, straightforward and honest character – and charisma! That´s 1 reason – the other, why most of all the MP`s are fighting against him – is his precise vision and the progressive programm FOR the working-class-people! He is clear in fighting against Austerity – Neoliberalism etc. and just the idea, to re-nationalize Railway is one of the MUSTS everybody sees and feels, that this must be achieved soon. On the other hand, neither of the 172 Traitors have so far just in 1 sentence … given a clear strategy, where the Labour Party should be positioned to – or aganist whom? O.K. aganst the Tories but with what set of ideas? With the same the Tories arepromoting – just with a little red coulour-point on the top? Mr. Smith – Corbyns opponent – isn`t really a Labour-Man of Jermys kind – I never can imagine, that a former Pfitzer-Lobbgyist will become Labour Leader??? Coming from a hypocritical racist like Abbott this article should be treated with the contempt it deserves. She is utterly delusional and whatever tenuous grasp she had on reality she appears to have lost. She sent her son to a private school because the ones in her own constituency weren’t good enough and crime ridden, that was after she had been MP for fifteen years. She used to organise a yearly conference to denounce the educational system as racist because of the low educational achievements of African Caribbean pupils and excused the outstanding performances of Indian and Chinese pupils by saying that the system was selectively racist! She objected to the employment of Scandinavian nurses in a Hackney hospital on the grounds that blue eyed blonds wouldn’t understand the needs of black patients. The fact that Left Foot Forward allows this drivel shows that it is scraping the bottom of the barrel for contributors. Personally, I’ve never voted for the Tory-lite Labour Party. Though I would happily vote for the ideas put forward by the current leadership. It seems thousands of others would even go so far as to join a party with those same political ideas put forward. Still doesn’t seem unelectable to me. “Labour’s current polling is calamitous. No party has ever won an election with such disastrous polling, or even come close. Historically any party with such terrible polling goes on to suffer a bad defeat. That’s right. You are Tory accomplices. You are knowingly keeping them in power. How do you sleep at night? Comments hear that are so dismissive and defeatist about the Labour Party led presently by the Right Honourable Jeremy Corbyn MP seem to suggest Labour should return to the kind of Party that panders to Tory-type policies that Blair promulgated, ultimately so disastrously, as the only way to government. There is nothing delusional about ‘true Labour’ seeking a purer Labour that was honestly, inclusively and forthrightly envisioned at our Party’s founding and given birth as it was from Unionisation in the workplace all those memorable, historic years ago. I am of the opinion Labour today is going through an exciting, readjusting phase in its history and will, even if with a bit of heartache hear and there where some Labour members entrenched in some status quo of centrist thoughts of power for power’s sake, need in no way feel afraid that the Labour Party is done for. It very much isn’t. On the contrary Labour, built as it was by ordinary members, is being taken back into ownership by unprecedented member numbers from parliamentarian self-servers who have ‘lost the way‘. Labour can and will be a real true, descent, ethical and unstoppable opposition Party to win all our hearts and minds. And here is why he wont win. I read this article with amusement. I assume it was meant to amuse. Either that or it is fiction written in an alternative universe. We live in what was a marginal Labour seat. It is now a safe Conservative seat. Former Labour voters refuse to talk politics as they are so disheartened by the state of the Party. Outside the London bubble, Corbyn is viewed as a joke. Corbyn’s first and major task he set himself was to regain Scotland from the SNP. The progress is such that at the local MSP elections, Labour were third behind the Conservatives. Corbyn’s personal polling is the worst of any Labour Leader. That’s the measure of how likely Corbyn is to become PM. – which any sensible person can see. These comments with 1 exception are straight propaganda, citing no clear references and relying on personal attack. The idea that Corbyn is to blame for Scotland is ludicrous. Labour pre Corbyn lost 40 of 41 Scottish seats in the 2015 GE. Under Corbyn a year later we retained 23 of 36 seats on the Scottish Assembly – nothing like the wipeout expected after the 2015 GE. We are the lead Party in the London and Welsh Assemblies and beat the Tories into 3rd place in Wales. Labour have won all 4 MP by elections since Corbyn was elected, 3 with an average increased majority of 7%. In May we retained the same number of councils as at Ed Miliband’s ‘high water’ mark of 2012. Labour Party membership has more than doubled with renewed energy for the LP throughout the country. I’m in SW Dorset far outside the ‘London bubble’ – membership has soared everywhere. Re the EU Referendum: 63% of Labour voters voted Remain, compared to only 42% of Tory voters. 75% of Corbyn’s constituency voted Remain. Smith could not even get a Remain vote out in his own back yard – Pontypridd comes under Rhondda which voted (54%) to Leave. Smith has not stood on any platform with any consistency for any amount of time. Smith’s history includes lobbying for Pfizer, being UK head of Amgen which was fined $762 million for endangering cancer patients lives, and Smith spoke against the NHS using cheaper generic drugs as this would be a disincentive for private pharmaceutical companies. In 2006 Smith could not say whether he would have voted for the Iraq War or not. In 2011 he voted for air strikes on Libya and he has consistently voted to renew nuclear weapons. On austerity – as well as failing to vote against the Tory Welfare Bill last Summer or against Tory attacks on such as WorkFare, Smith is on record as saying public spending cuts are ‘not unnecessary’. Corbyn has stood on a solid anti War/anti austerity platform for the 33 years he has been an MP. Corbyn’s efforts to secure peace internationally, which have meant discussions with all parties, led the Ghandi Foundation to give him their International Peace Award in 2013.